It's like fighting zombies. Zombies with guns ... and helicopters. Just as with the previous games, Modern Warfare 3's Spec Ops mode features mission-based gameplay on the game's single player maps. This time, however, there is also a survival mode where the player fights wave after wave of enemy soldiers on game's multiplayer maps. 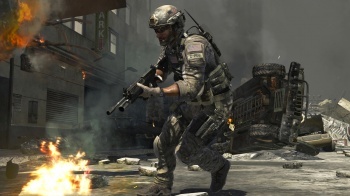 The survival mode has been compared to the zombie modes found in Treyarch's Call of Duty games, although obviously with an extra level of complexity. Zombies can't pilot helicopter gunships, for example. When our intrepid reporters tried out Modern Warfare 3's Spec Ops at E3, they called it a "combination of everything that makes [Modern Warfare] multiplayer great, funneled into a challenging horde mode," and it seems like plenty of other people have had a similar reaction. You'll be able to see if it lives up to the hype when the game comes out for PC, PS3 and Xbox 360 on November 8th.